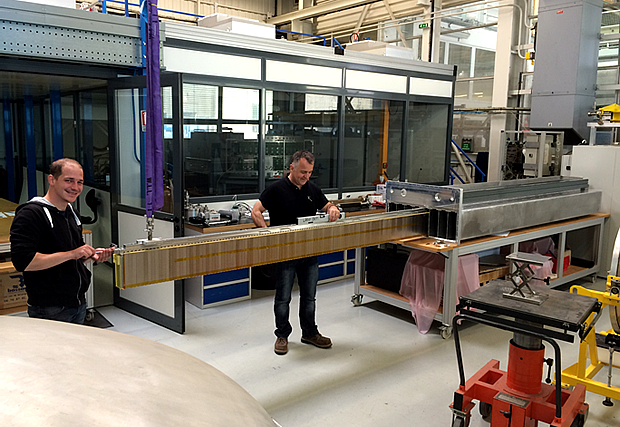 Seven years of R&D, first based at ILL and now at ESS, with critical work done in Linköping, have produced the first Boron film-based large-area detector prototype validated for use by ESS instruments. The integration project now enters the detailed design phase. OAK RIDGE, LUND and GRENOBLE—For one year now, a Boron-10 Carbide (10B4C) film-based large-area detector prototype built at the European Spallation Source (ESS) has been collecting data at the Spallation Neutron Source (SNS) in Oak Ridge, Tennessee. 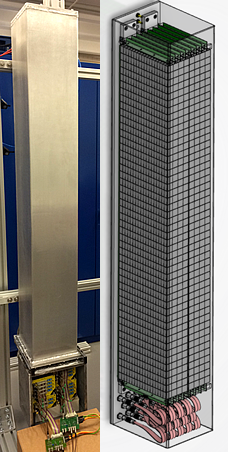 The 1.4-metre-high solid-state detector is installed within an SNS instrument’s detector chamber, directly adjacent to its existing Helium-3 detector. 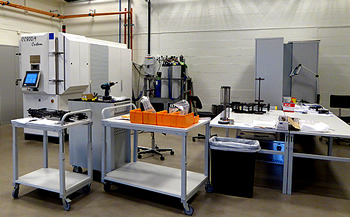 The setup has allowed for real-world scientific results from the two very different detector technologies to be collected and directly compared while the instrument remains in use for scientific experiments. The Boron-10 and Helium-3 detectors have been gathering parallel data since July 2016 over the course of the spectrometer’s normal operations. An analysis of that data by the ESS Detector Group, with the help of the instrument teams for CSPEC and T-REX, two direct-geometry spectrometers under construction for ESS, has led to the large-area detector’s formal adoption as the baseline detector technology for these two instruments. The technology will also be required by the later instrument, VOR. “We completed the characterisation on test beams and test sources, and one short experiment on a time-of-flight instrument, that all indicated the Multi-Grid would perform as expected. Now we have confirmed this with results on an instrument that is operating for a very long time in very different conditions, with different samples, and at different neutron energies,” says ESS detector scientist Anton Khaplanov, who leads the development of the Multi-Grid detector for ESS instruments. It was during the 2015 ESS Annual Review that a member of the review committee, Ken Herwig of the SNS Instrument and Source Design Division, suggested that the SNS instrument CNCS (Cold Neutron Chopper Spectrometer) would be the ideal host for battle-testing ESS’s new detector technology. Like the ESS facility design, SNS is a high-power, pulsed spallation source. The ESS Multi-Grid detector prototype (MG.CNCS) was then built to the specifications of CNCS, a cold neutron spectrometer like CSPEC, under the guidance of the instrument’s lead scientist Georg Ehlers of SNS. Building on R&D originating at France’s Institute Laue-Langevin (ILL), and with funding delivered through the European Union’s BrightnESS project, the ESS Detector Group is working to develop better detector technologies, including the Multi-Grid, for six of the ESS instruments. A scientific instrument is only as good as the data it produces, and in the case of neutron instruments the data are only as good as the instrument’s detector. As researchers work to model the physical properties of materials, films and tissues using neutrons, it is the detectors that serve as both the lens and the photographic paper for the software-generated visualisations that are produced. In a neutron scattering experiment, the neutrons encounter the sample as a focused particle beam and collide with the sample’s atomic nuclei, which scatters them in as many directions as there are neutrons. Acting as the backstop to the area surrounding the experiment’s sample location, the detector absorbs the scattered neutrons. Neutrons, however, are particles without a charge, and detecting them can be a challenge. When a neutron “hits” a detector, the event is in fact a reaction between the neutron and a mediating compound, which converts the neutron to an electric pulse. That pulse is counted, time-stamped, converted into position in three-dimensional space, and transmitted as a data point to a computer. Taken together with an instrument’s known metadata and constants including the distance between the ESS Target and the sample, and the distance between the sample and the detector, the data are compiled to develop a two-, three-, or four-dimensional model of the interactions between neutron and sample. This can be a structural analysis of the sample, but will also include magnetic phenomena and real-time changes in physical properties stimulated by the experiment’s conditions. At ESS there will be more neutrons coming off a sample than a detector can handle. The facility will sport the most powerful linear proton accelerator ever built, and will be capable of producing up to two orders of magnitude more neutrons than existing facilities. So the number of neutrons that an instrument’s detector can count before being overwhelmed with data will be critical in delivering on the promise of the extraordinary brightness of ESS. 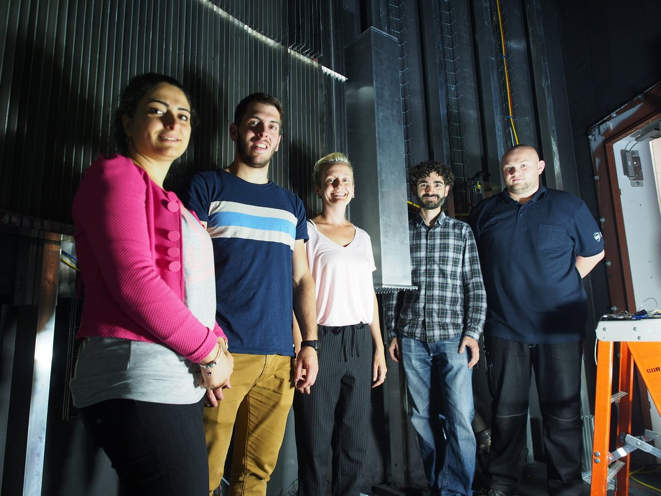 Scientists at ESS and its partner labs must therefore work to build detectors that are as innovative as the facility’s world-leading instruments in order to leverage this high neutron flux. Better performance, however, is only one of the BrightnESS project’s motivating factors. Another concerns a shortage of Helium-3, the current basis medium for neutron detectors around the world. Primarily stockpiled as a by-product of nuclear weapons development, the once-plentiful supply has been dwindling. The cost of building hundreds of square metres of conventional neutron detectors for ESS grew to prohibitive amounts and future availability remains uncertain. The Detector Group’s R&D is therefore focused on using the alternative, solid-state technology: aluminum alloy substrates coated with a 10B4C thin film. The coating is applied through an innovative sputtering process developed by Linköping University’s Thin Films Physics division. This process is now standardised and executed by the ESS Detector Coatings Workshop established in Linköping in 2014. Apart from ensuring that each instrument will be built with as much detector coverage as possible, the new Boron-10 technology will open up the range of experiments possible with neutron instruments. Led by researchers at ILL in Grenoble, the world’s flagship neutron science facility for nearly five decades, the European Strategy Forum on Research Infrastructures (ESFRI) was already seeking an alternative to Helium-3 gas detectors based on the promise of the Boron-10 films technology. It was at ILL that the Multi-Grid concept and its early prototypes were developed. From 2010 to 2014, the Cluster of Research Infrastructures and Synergies in Physics (CRISP) developed common solutions in the fields of Accelerators, Detectors, Instruments and Experiments, as well as Information Technology and Data Management. The collaboration among the 11 ESFRI institutions was funded in part by the European Commission. Guérard led the CRISP Detectors Subproject to its crowning achievement, the development of a full-scale demonstrator of the Multi-Grid. This prototype was modelled for the IN5 spectrometer at ILL, but also served to demonstrate a production capability on a scale similar to that required for large chopper spectrometers, such as those now being designed for ESS. Or a thousand—ILL’s IN5 demonstrator, which is now kept in a workshop at ESS, has 1,024 of these metal grids, coated in Boron-10 film at Linköping and wired for detection at ILL. The CRISP collaboration developed and extensively characterised four prototypes of the detector’s design, and it is this work that the BrightnESS project has built on. In addition to Khaplanov, Francesco Piscitelli, a detector scientist also now at ESS, was part of ILL’s work under CRISP. 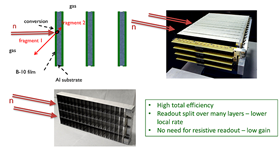 Piscitelli now leads the development of another Boron-based detector for ESS that has its origins at ILL, the Multi-Blade. 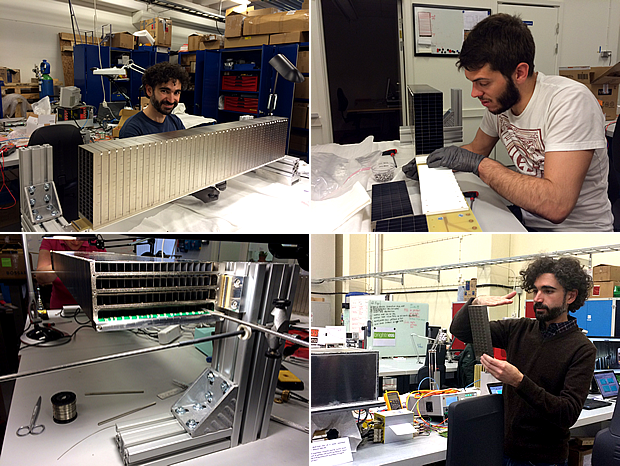 The Multi-Grid CNCS prototype will continue to collect data at SNS for now, but there is plenty of work left to do. Guérard’s team at ILL is investigating the latter, how best to circulate the detector gas from a high-pressure to a low-pressure environment and back again. Continuing to work on the Multi-Grid through BrightnESS, another focus at ILL is to prototype a different geometry for the detector that will eliminate the dead spaces at each grid’s very small margins. Multiplied over a large area, these uncounted neutrons can add up to a significant performance factor. “We’re also doing some new detectors,” says Khaplanov of his team at ESS. “At the moment we are ordering parts for one that is optimised for T-REX, which measures at higher energies. To do this, we will increase the number of B4C layers from 32, as in the CNCS prototype, to 40, and also increase their thickness.